Christmas has come early for all the party animals! 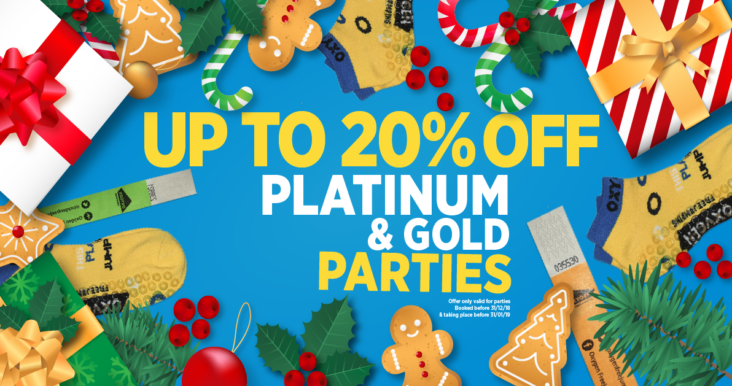 You can now get up to 20% off your platinum or gold party package. There’s so many things to consider when planning a party. How many guests, how much food and what do you do for entertainment? At Oxygen, we like to make things easy for our birthday jumpers, which is why we have three incredible party packages. We also take pride in making our customers happy. *Please note discount price is dependent on park location. Parties must be booked by 31/12/2018 and must take place by 31/01/2019.